It is one of three microbes chosen for the BioRock experiment, run by a research team from the University of Edinburgh in the UK, that will test how altered states of gravity affect biofilm formation on the International Space Station. Microbes are able to weather down a rock from which they can extract ions. This natural process enables biomining, in which useful metals are extracted from rock ores. Already a common practice on Earth, biomining will eventually take place on the Moon, Mars and asteroids as we expand our understanding and exploration of the Solar System. In the meantime, microbes will be used for many other processes that involve microbial growth on rocks, such as making soil. In preparation for the experiment, researchers performed a "dry run" on Earth ahead of BioRock's launch to the Space Station aboard a Space-X cargo resupply mission in July. Cells of one of three organisms that will be used for BioRock were inoculated and dried on a sample of basalt, then given 'food' to restore cell growth. The biofilm was left to grow for three weeks at 20°C, then preserved and stored at 4-6°C for one month. Researchers finally observed the sample under a fluorescent microscope to assess its performance. And it performed beautifully. A patch of biofilm is visible to the right of the central cavity, which is the basalt's natural porosity. The results of the dry run show that the experimental conditions for BioRock, from the choice of the organism to the storage temperature and timing, are appropriate. This experiment also gave researchers the first clues as to what would be most interesting to focus on when samples return from space. Using post-flight data, researchers will map out how altered states of gravity affect the rock and microbe system as a whole. 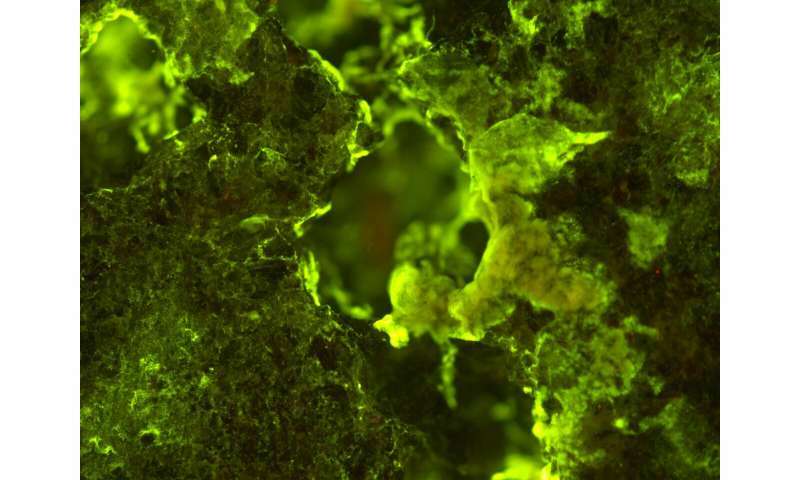 The results hope to shine light on extraterrestial biomining technologies and life support systems involving microbes for longer duration spaceflight. Biomining in space can also increase the efficiency of the process on Earth and could even reduce our reliance on precious Earth resources. Could electricity-producing bacteria help power future space missions?